Humans are drawn to faces. Our brains are built to see them. Indeed, more of our brain is engaged in facial recognition than the recognition of any other visual object, says neuroscientist Eric Kandel in The Age of Insight. Even face-like houses with windows for eyes and doors for noses attract us. So what happens when public buildings lack a face-like facade? Sooner or later, they’ll get one. My recent article in Metropolis on Why Brain Architecture Matters for Built Architecture describes how our hard-wired obsession with faces spills over to what we create and admire. It’s a reflection of the fact that we see the world—like an animal—which makes sense, of course, because we are one. Our brains favor fast orientation, and nothing quite gets to us like that bilaterally-symmetric shape with central door and windows neatly arranged on either side. We find it reassuringly familiar. It’s been orienting us since birth. You can see the pattern very effectively at work in Palladio’s famous Villa Rotunda in Vicenza, Italy as well as in the simpler, but endearing, cottages in Oak Bluffs, Martha’s Vineyard, built more than three centuries later. Both places, interestingly enough, are legally-protected historic sites. People don’t want to change or demolish them because we like the way they seem to see us, even care about our existence. And we care about them. They get a face! It happens like magic. Usually it’s a cartoonish face or a photograph. Generally, it’s got nothing to do with the architecture—but, of course, the face grabs our brains anyway. It’s what evolution, the most powerful designer on the planet, built us to look for, and we can’t escape it. Here are some favorite examples. Below are the “before and after” pictures of the Cincinnati Arts Center. The 2003 building (far left in photo), designed by ‘starchitect’ Zaha Hadid, apparently didn’t lure the public in the way it might, so curators permantently installed a sculpture with a neon face by the front door in 2014. (see photos at center, right) I can’t quite call it fine art, but the ‘robot’ did get me to take a second glance at a facade that otherwise gets lost in the jumble of a city block. It makes the building feel friendlier. 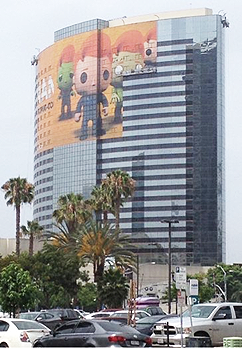 A simpler case in California shows large faces of comedian Conan O’Brian affixed to the Marriott near the San Diego Convention Center before the Comic-Con International festival this past July. In this case, it’s a temporary installation—and it certainly grabs your attention and gets you to look up, in ways the plate glass monolith doesn’t. 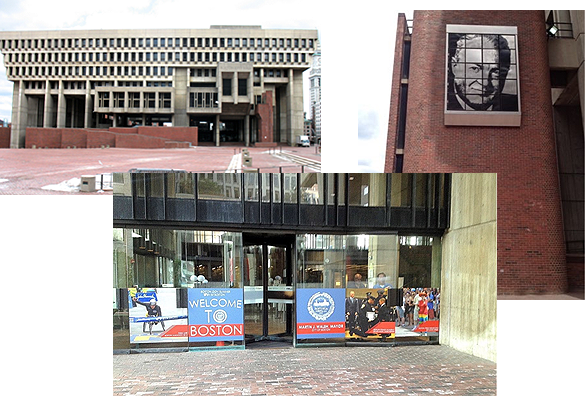 Below are pictures of Boston City Hall, a famous brutalist structure. Boston Mayors have long tried to broaden its appeal. In 2002, the face of former Boston Mayor John Collins, in office when the building went up, was permanently affixed near the entry, more than thirty years after construction. This year, Boston’s new Mayor, Marty Walsh, greatly expanded the facial theme on the front elevation by adding more than a dozen faces directly to the entry facade. This ‘Welcome to Boston’ photo montage appears to be a semi-permanent installation. My favorite, however, may be outside Frank Gehry’s famous Bilbao Museum. 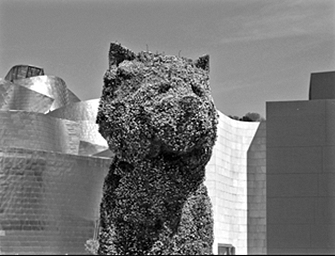 Jeff Koons’ Puppy Face was placed at the entry—before this museum in Spain even opened to the public in 1997. How can we not feel happy when taking in a baby animal face? Although, come to think of it, when I look back in time, I have to admit, the one below, not quite as cuddly, is riveting, too. It really defines the genre. It’s a shot of one of the Pyramids at Giza, Egypt, with the Great Sphinx in front. 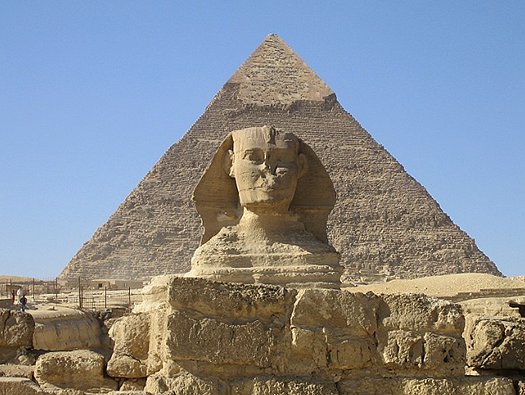 The pyramids are about 5000 years old, and the Sphinx of similar vintage, shows the mug of a long-ago pharaoh who’s definitive identity appears lost in the sands of time. 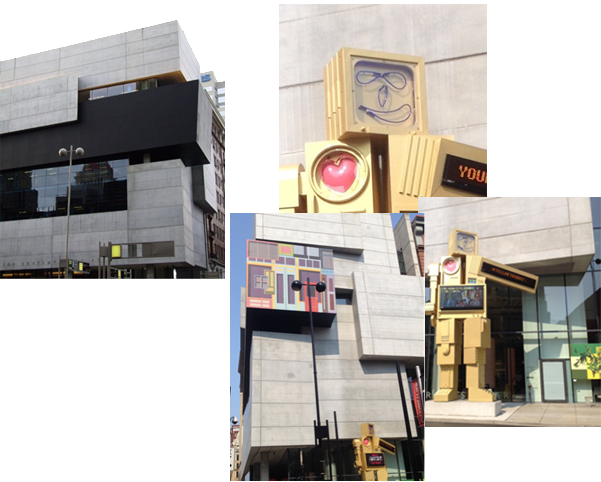 If you have a favorite example of a face-affixed building, send a photo along. It’s fun to consider how a simple face changes how we attach to and remember a place. This entry was posted in Architecture, Design and tagged Architecture, Design. Bookmark the permalink. 1 Response to No Faces – We’ll Affix That!